In the past I have not requested feedback for my modules, though I have sought general feedback as a course coordinator at the programme level (which did give me some feedback on my own modules). 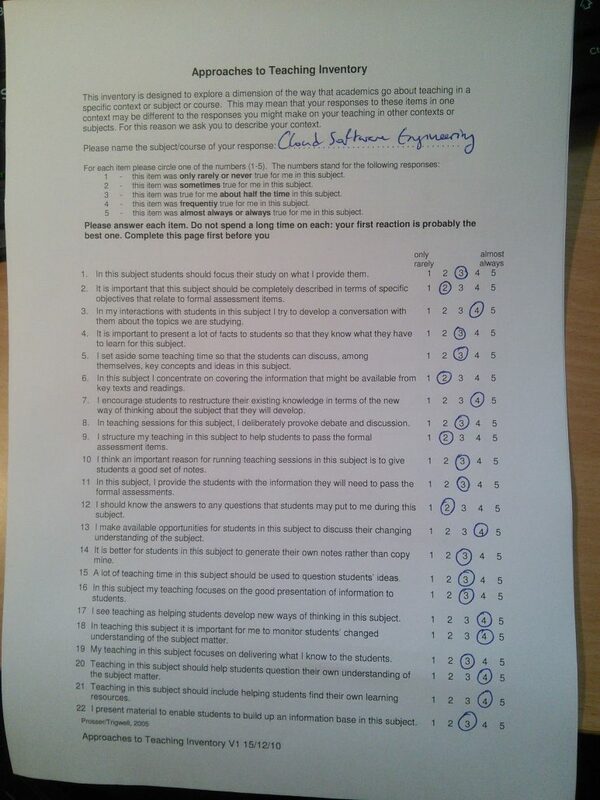 I also garnered some feedback indirectly from student reflections, e.g. what learning resources they liked, which topics they found difficult. Unfortunately with Blackboard modules being wiped after 2 years, a lot of valuable data has been lost, but it has given me a general sense over the years of what works for students. There are 3 main approaches to evaluate one’s practice – student surveys, self evaluations and peer evaluations. Stephen Brookfield (2002) lists those along with a fourth: theoretical literature. The latter would require one to be widely read in educational literature and, I would argue, to participate in continuing professional development, which is the main reason for taking this SPA, to challenge what I think I know and to expand on what I know. For the Cloud Software Engineering module, I performed a mid-term student survey and followed this up with a self evaluation. Peer evaluations aren’t the norm in CIT, though it would be possible with online learning to have another lecturer view a sample of online lectures and provide feedback. I used Google Forms for this and I got 9 responses, which I was very pleased with considering rates of response tend to be much lower for surveys. The responses and a thematic analysis are presented in Appendix A below. There was just enough data to make some conclusions and raise follow-up questions for me. I have performed a content analysis using the approach outlined in Graneheim and Lundman (2004) and the terminology emphasised hereafter is defined fully in that article, including synonyms. I examined the text of the student responses for both manifest content and latent content – the former being what is obvious and the latter what is inferred; there is a level of interpretation in both, but more with the latter. I searched the content for meaning units (words or phrases relating to a central meaning), condensing where necessary, and then abstracted the higher-order headings – codes, categories and themes. The feedback was largely positive from several perspectives related to student-centred learning with negative feedback centering around information overload. By and large, students find the module very relevant to industry with a wide range of topics delivered in an integrated way. The instruction is clear and the experience of the lecturer shows – this backs up my cognitive apprenticeship approach. The materials are very useful, such as tutorials, exercises and videos, but students would like to see more of them – the comments included feedback indicating that my approach to scaffolding (as Vygotsky would put it, discussed in Berk and Winsler, 1995) some of the active learning (e.g. step by step tutorials followed by an exercise) was successful, allowing students to gain a foothold in autonomy (it emphasizes student independence, as Boud, 2012 puts it). The online experience was negative for some students with feelings of isolation and occasional technical challenges, such as scheduling group interactions – Garrison (2011) writes about the opportunities inherent in e-learning platforms for a rich community of learners, but despite social media groups with Google+, the synchronous Adobe Connect with chat, group project tools like Trello and Google Hangouts, there is room for improvement and the suggestion of richer online interaction (e.g. using voice and webcams) warrants further investigation. 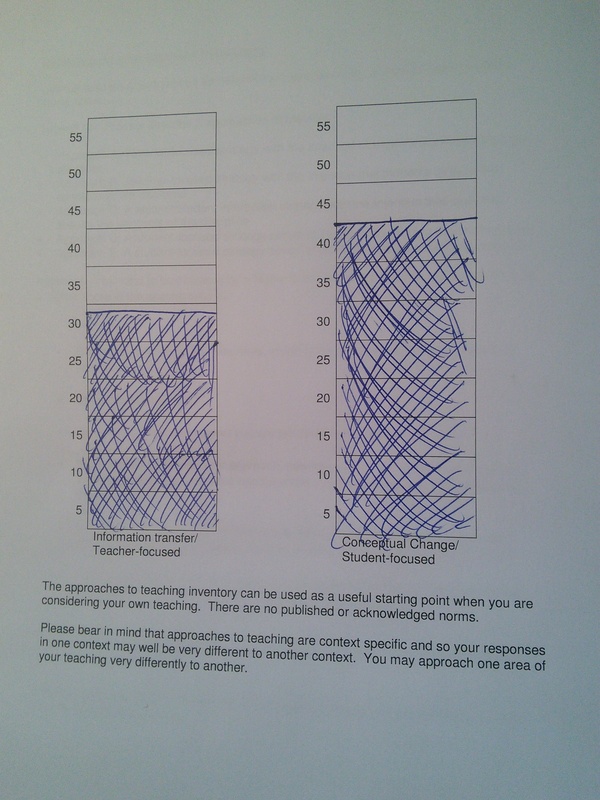 A large percentage of the students reported that there were too many topics to cover in such as short space of time, while others pointed to the range of topics as a positive – it would seem a middle ground needs to be found where a wide range of relevant topics can be presented while slowing the pace down and allowing even more time for active learning. The latter point of information overload is one that I have been aware of for some time, but there is a factor playing into that: the Springboard+ programme for reskilling mature students demands that courses are relevant to industry and intensive (it is almost an extreme apprenticeship) so that those who graduate can quickly be assimilated into the workplace. However, my philosophical position is that I should look after the mental health of my students – or at least play my part in not over-stressing them. With that in mind, the main take away from this evaluation is to reduce the amount of content and to increase active learning through more activities like the GitHub collaboration exercise, and to make even more use of audience response with PollEV to revise before moving on. Having said that, dropout rates are down on previous years and the quality of assessment submissions is at least on a par with previous years with some students excelling, so while they report being overloaded, they are able to submit their assignments on time and to a good standard on average. For the self evaluation, I chose a method that focuses not just on providing metrics or simple score, but also prompts reflection. One such method is provided by Trigwell and Prosser (1999), which attempts to provide a link between teachers’ approaches to teaching and students’ approaches to learning. Their approach is based heavily on the research of Marton and Saljo (1976), Biggs (1978) and Ramsden (1983) from the perspective of deep versus surface learning (all quoted in Trigwell et al., 1999). In addition, they underpin their approach in terms of the links between teaching and learning with reference to Ramsden (1992), which suggests that student perceptions of learning are based on the environment they learn in – a deep approach is associated with perceptions of high quality teaching. Trigwell et al. (1994) identified five approaches of teaching, ranging from approach A which is the most teacher focused (pure transmission) to approach E which is the most student focused (where students question what they learn, build self-awareness, etc.). Which all leads to the questionnaire called the ‘Approaches to Teaching Inventory’ from Keith Trigwell. The questionnaire has a number of sections: a series of twenty-two questions with a Likert scale answer, a scoring table, a simple bar graph, and a number of questions that prompt reflection on the results. I think the questions are best considered with the accompaniment of the results of a student survey, as I have done, to see if there is a correlation between what I think and what the students are telling me. A scan of the questionnaire (which I filled in by hand) is in Appendix B. 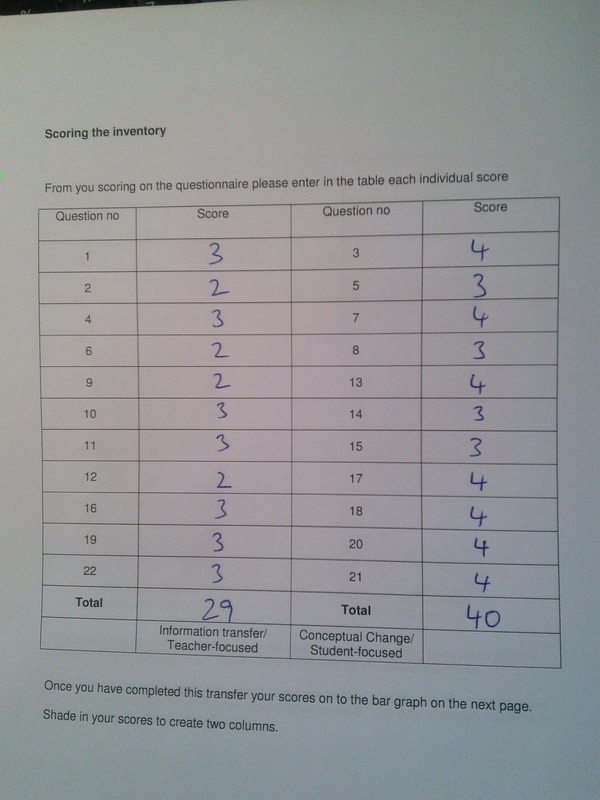 When it came to answering the twenty-two questions, I found myself reluctant to provide any scores of 1 or 5, so all my responses were in the range 2 to 4. However, when I totted up the scores and shaded in the bar graph, there was a clear difference between teacher-focused and student-focused approaches. I do not think the intention of the inventory is complete accuract, rather to do a side by side comparison to see if one is more student-centred than teacher-centred. My results indicated that I am more student than teacher focused (somewhere between D and E, perhaps), which is not surprising when looking at the results of the mid-term evaluation where on the one hand I tended to overload the students with too much information (a bit teacher focused) but more than counterbalanced with student-centred resources, choice of learning methods, imparting of teacher experience to make what is taught relevant and engaging, and so on. The results, I think, show that I am primarily student-focused in my teaching with evidence from the students to back that up and the self evaluation shows my preference for how I should teach a technical, hands-on subject like Cloud Software Engineering. It does point to areas of improvement, such as slowing down the delivery of content to allow for more discussions, for example. As Prosser et al. suggest, the results should be viewed in their context – this was a busy time with PhD, this SPA and other draws on my time; with more time to dedicate, I am sure I would have done better. Brookfield, S.D., 2002. Using the lenses of critically reflective teaching in the community college classroom. New Directions for Community Colleges 2002, 31–38. Berk, L.E., Winsler, A., 1995. Scaffolding children’s learning: Vygotsky and early childhood education. National Association for the Education of Young Children. Boud, D., 2012. Developing Student Autonomy in Learning. Taylor & Francis. Graneheim, U.H., Lundman, B., 2004. Qualitative content analysis in nursing research: concepts, procedures and measures to achieve trustworthiness. Nurse Education Today 24, 105–112. Trigwell, K, Prosser, M, & Waterhouse, F 1999, ‘Relations between teachers’ approaches to teaching and students’ approaches to learning’, Higher Education, 37, 1, pp. 57-70.